The problem with kids who play sports is that they have parents. And the problem with those parents is that they tend to show up at their kids’ games. Parents and youth sports games aren’t always a good mix, say coaches, league officials and others in the Wichita area who have spent a lot of time trying to help kids learn about exercise, teamwork and the other positive values that sports can teach. Ed Scarry, who has been a coach and team director in the Greater Wichita Junior Football League for 27 years, remembers the time a bunch of parents spit on his son’s team and called them names as the team tried to leave a local park after beating their team. That happened 20 years ago. “If I could take the parent aspect out of Little League football, everything would run great,” he said. The role of parents in youth sports came into focus again last week after a GWJFL coach was attacked Monday night by a group of men at a practice at Linwood Park, prompting the brandishing of firearms by the parties involved and the coach’s wife firing a shot into the air. The incident remains under police investigation. The team’s director has said the incident started when the mother of a former player confronted the coach over her son not being allowed to play in the season opener Sept. 6. The goal of youth participation in sports is to promote lifelong physical activity and healthy competition, officials said, but too often adults approach their kids’ games with their own goals, such as fame, money, Olympic medals and college scholarships. Scarry said he’s had parents of grade-school kids demand that he let their sons carry the football more often to get a scholarship. Gregg Heinzmann, director of the Youth Sports Research Council in the Department of Exercise Sciences and Sports Studies at Rutgers University, would agree. He said some parents who meddle in their kids’ sports games think they’re not being good parents unless they are advocating for their children around the clock. Parents who do that – “helicopter parents,” he calls them – are sending a message to their kids that they aren’t smart enough or capable of making their own decisions, which hurts the children later in life when they have to join the real world. “The advice we try to give parents is, ‘It’s their life, let them live it. You have to give them the opportunity to fail in orderfor them to understand what success is,’” Heinzmann said. Problems in youth sports often arise out of lack of communication between leagues, coaches and parents about rules, expectations and conduct. Those need to be established before competition begins, he said. Parents should know how to communicate grievances with coaches and not let them fester. And leagues need to have mechanisms in place to hold people accountable for violating their codes of conduct, Heinzmann said. Leagues in the Wichita area tend to have those. Darrin Regier, president of the Mid-States Junior Football League, which has teams for first- through sixth-graders in 36 area communities, said his group has directors at every game to keep an eye on things, including bad behavior. “We just don’t tolerate it,” he said. Information about any incident is included on a weekly newsletter sent to all the directors, Regier said. The measure is a powerful deterrent because “everyone in the league is going to know about it,” he said. If a coach doesn’t shake hands with the opposing coach after the game, the rest of the league is going to know about it. If parents are bickering in the stands, the league will hear about it. At the same time, he added, what happened at Linwood Park could happen anywhere. Vic Boydo, president of Sedgwick County Soccer Association, said the organization has policies in place handed down from official sanctioning bodies such as the Kansas State Youth Soccer Association, U.S. Youth Soccer Association, U.S. Soccer Federation and Federation International of Football Association. The policies send a strong message to everyone participating in the league. “Any event that takes place at our soccer complex is subject to the rules laid out in both our Operations Manual for coaches, as well as the FIFA Laws of the Game that referees are trained to enforce,” Boydo said in an e-mail to The Eagle. Coaching certification through Kansas Youth Soccer and the Kansas State Referee Development Program stresses the importance of good behavior on and off the field. All team officials also are subject to a background check. “Spectators, players, and coaches are expected to respect each other and even bad language, spitting and, of course, physical abuse is subject to disciplinary actions including game suspensions, banning from the league and monetary fines,” Boydo said. Spectators’ offensive behavior can cause a team to have to forfeit a game or be suspended from the league. The city’s Park and Recreation Department, which sponsors the GWJFL, requires parents to sign a code of conduct. Interim director Marty Miller said he doesn’t know whether those involved in last week’s incident at Linwood Park signed the document. Sometimes sports leagues have to take a hard look at themselves to see whether they’re fostering an environment that encourages emotional eruptions. Westurban Baseball is one of the city’s oldest sports organizations and currently has about 2,000 players competing 70 to 80 nights each year. Eric Blasdel has been associated with the league for 25 years in some capacity, including as a coach and board president. When he took over as general manager in 2001, Blasdel said, “We had such a reputation citywide of win-at-all-costs. We’ve tried to develop the mantra that we’re here about the kids, and we’re here to develop kids. Westurban parents are required to sign a document outlining a code of conduct. Sportsmanship is stressed at preseason meetings with coaches, Blasdel said. He was well aware of the incident at Linwood Park. Blasdel estimated that 10 years ago the league saw 35 to 40 coaches ejected from games each year. Now the number is about 10. An ejection draws an automatic one-game suspension for the coach. A parent who is kicked out of the league’s complex is suspended for three games. “Our biggest problems are always with parents,” Blasdel said. Usually one or two parents draw a suspension each year, he added. Several league directors are at the complex during games, monitoring behavior. He sees the coaches and parents just as passionate and says they “have the same capacity to say and do stupid things” as they always have. Coaches have become better at drawing the line, he added. Most misbehaving parents tone it down after a league official talks to them, he said. League organizers and coaches said taking preventive measures is the best way to minimize problems. That includes meeting with parents before the start of a season to address everything from playing time to proper conduct at games. “We always told everybody, if you’re not happy with playing time, wait until Sunday or Monday, send an e-mail, come talk to the coach,” said Jeff Blubaugh, a Wichita City Council member who spent four years coaching a Goddard football team in the Mid-States league. “Don’t ever talk about it right after the game. Blubaugh said he also understood how his conduct on the sidelines could fuel volatile reactions in the stands. The kids are also watching. Travis Lankford, team director of the Raiders’ GWJFL team, coaches one of the teams and has been in the league for 14 years. He agreed that negative attitudes of parents rub off on their children. “If their parents don’t act right, the kids won’t act right,” he said. And football, a collision sport in which kids are supposed to hit kids on the playing field, can bring out bad behavior in parents, he said. A lot of them buy into that, he said. Some don’t. As director of sports initiatives for the Greater Wichita YMCA, Josh Whitson oversees youth teams in numerous sports that have 20,000 to 25,000 kids participating annually. Whitson said that before every YMCA game, players from both teams gather to recite out loud together a pledge that stresses sportsmanship. “We say it loud enough so fans can hear,” he added. While that helps set the tone, coaches also are asked to hold parent meetings to talk about what is expected at games. That has helped, Whitson said. But it’s also about having staff trained at games to “look, listen and feel” for potential problems. “It’s being on the front half and not the back half,” Whitson said. “If you have parents that are really vocal, hopefully it’s, ‘That’s a great job, Johnny.’ But if it’s not, there’s probably an issue. Once a problem is spotted, a staff member tries to address it with the fan or coach. If that doesn’t work, the person is booted from the premises. Whitson estimated that the Y has had to talk to a coach or fan about their behavior only once or twice a year for each sport. Matt Flaming, executive director of Mid-America Youth Basketball, which holds tournaments in the Midwest that draw 30,000 to 40,000 youths, plus thousands more parents, said the games have experienced parents yelling, and maybe a few confrontations that fall short of fighting, but nothing worse. MAYB provides plenty of supervision at games to diffuse situations before they escalate, he said. Those supervisors haven’t been formally trained to do that. But in light of the Linwood Park incident, the league may provide instruction on what to watch for, Flaming said. League 42 is a baseball organization that was formed last year to give inner-city kids a chance to play the sport. But that initiative has meant more than teaching youths how to hit, field and throw. Parents also are instructed that the league is about sportsmanship, fair play and participation, said Bob Lutz, a sports columnist at The Eagle who also is the league’s founder and board chairman. League volunteers also are at every game. If a parent does get too rowdy, he said, “We talk to them, we try to calm them down. We try not to be heavy-handed about it. Lankford, the Raiders team director, said he thinks parental attitudes have gone downhill. He hears more comments from parents toward kids, coaches and officials at football games now than he used to. They complain about playing time, coaching techniques and bad calls by officials, he said. He’s seen fights between parents and coaches throughout the league, and heard of a large scuffle involving parents of kids who were on the same team after a game a few years ago. Scarry, assistant director of the Gators, said he and other coaches in the organization patrol the sidelines of their teams’ games to watch out for problem parents in the stands and cool them off before matters get out of hand. Trouble most often comes from parents who don’t attend practices regularly and are surprised and angry on Saturday when their kid isn’t playing, he said. As the father of two daughters active in sports, Mike Anderson has seen his share of parents become outraged at games. His oldest daughter, now a freshman at Bishop Carroll High School, is on an elite-level softball team that plays weekend tournaments. “You see the occasional over-the-top parents – I don’t know if they’re trying to live vicariously through their kids – who are way out of order,” he said. But he doesn’t see the problem as any worse today than it was when his daughter started playing T-ball. “You always see parents who are out of line,” Anderson said. Ray Staats, who, along with his brother, Tom, spent decades coaching and serving as leaders of Biddy basketball, said publicity has helped the situation. He saw behavior improving before he stepped down from the program in 2008. Playing time is frequently a source for conflict between parents and coaches. Most leagues have specific rules requiring each child see a certain amount of playing time. But Staats said he always reminded parents that children’s physical abilities blossom at a different pace. “Some kids develop sooner,” he said. “If you’re a lucky parent, your child will develop later and pass up ones who develop sooner. If you can not answer yes to each of these outlined items, look for another league or team. For any league or team NOT to be providing or requiring a physical, background checks, player injury insurance, accredited certification of the coaching staff, or equipment that meets the minimum standards, is not an organization that is first concerned with the well being of its players. 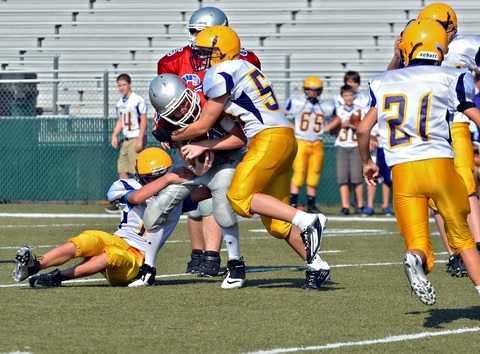 Should Weight Limits Be Required in Youth Football? Everyone has heard anecdotes about the personal observations from administrators, coaches, and parents about the occasional legendary player who is significantly heavier, stronger, and faster and who is the source of multiple injuries to much smaller players. I’m not saying that these stories are not credible, but it is best to look to scientific studies on this topic to determine if these instances are isolated vs. common and to determine if the injuries are more severe than normal. There is a compelling scien tific study by the Mayo Clinic that is dead on point for answering these questions. As you are probably aware, the Mayo clinic has a stellar reputation in the medical community. In other words, this was no Mickey Mouse study, it was based on pure science. Most injuries were minor with most being bruise/contusions which accounted for 60 percent of total injuries. Seven percent of total injuries were bad enough to prevent players from participating for the rest of the season; all of these were ankle fractures. The risk of injury for an 8th grader was four times the risk of injury for a 4th grader. Therefore, the number one risk factor for injury is age. The higher the age, the higher the chance of injury and as a result, correct age groupings are critical to limiting injuries. To the surprise of many, heavier players sustained more injuries than light players. Therefore, specific weight groupings would not appear to protect lighter players. As to why lighter players are not injured more frequently than heavier players, he cited the old formula: force = mass x velocity. He stated that older players get hurt much more often because they run faster and hit harder. Youth players who are larger don’t necessarily impact with more force if they aren’t fast and strong. The number one determining factor of speed and strength is age maturity, not weight. He concluded that lighter players would likely be safe within their own age group. What purpose do weight classes serve? It is important to note that neither 6th/7th graders, junior varsity, high school, college, nor pros find it necessary to divide by weight classes. Could you imaging the outrage if these groups were told that they needed to move towards weight classes? If 6th/7th graders and 8th/9th grade junior varsity teams are not required to have weight categories for safety purposes, why should they be forced on the same age groups in non-scholastic youth football? And why should the age groups under 6th grade have weight categories forced on them since very few injuries actually occur in these age groups, according to the Mayo Clinic study? Many communities are too small to draw enough participants to field teams if restrictive weight categories are used. There is an obesity epidemic in this country and too many kids who are overweight may have to sit out and not get much needed exercise resulting in health problems down the road. Specific weight categories may force youth to drop weight in order to make the weight category and the result can be very unhealthy and even dangerous resulting in increased liability potential. One popular technique for dropping weight involves limiting the intake of fluids. This can lead to dehydration which is the number one cause of heat illness. Weight categories that allow younger/heavier players to move up to an older age group can place the younger heavier athlete at increased risk of injury since the primary injury factors are age related based on speed and strength. Weight categories that allow older/lighter to move down to a younger age group can place the younger age group participants at a greater risk due to the greater age related speed and strength of the older player. Both American Youth Football and Pop Warner Football, the two largest youth football organizations in the U.S., offer unlimited weight classes. Therefore, a standard has been set for their acceptability. Each community should choose based on its own needs whether to use unlimited, weighted, or modified classes. Should they choose to use unlimited classes, they can do so with confidence that there is no scientific basis to suggest that they are riskier than weighted classes. Age groupings and not weight groupings are the best predictor or injuries and safety in youth football. Please also see our related article that includes findings from a more recent study backing the findings discussed above.